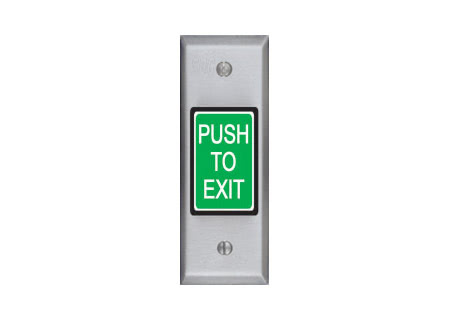 This narrow frame mount exit switch assembly includes a large push button on a narrow frame mount plate with push switch signage "PUSH TO EXIT". Special finishes, Chrome, Brass, Bronze, Dark Bronze The illuminated momentary switch button is 2" inches high and 1-1/4" inches wide for easy activation and is visually conspicuous. The faceplate base material is stainless steel and the high impact resistant button material stands up to abuse. 412N SDC "PUSH TO EXIT" Switch, 2" High Button, Illuminated Lens, MO SPDT, 5 Amp, Narrow Faceplate. 413NU SDC "PUSH TO EXIT" Switch, Integreted 12/24VDC 1-60 sec. Timer, 2" High Button, Green, Illuminated Lens, DPDT, 2 Amp, Narrow Faceplate. 413PNU Integrated pneumatic timer, adj. 1-180 seconds. 12/24VDC, 3A DPDT Contact. 413MNU Integrated Fixed 30 Seconds Timer. 12/24VDC, 2 Amp DPST Contact.